Most Indian weddings include a baraat, which is the official entrance of the groom. Some weddings include walking baraats. Some include a white horse. And some include an elephant. Here in Southern California, that elephant is usually Tai from Have Trunk Will Travel. Baraats are crowded, noisy and fun, as this is the groom's family's time to shine. Crazy dancing abounds, and everyone is smiling and cheering. Photographing a baraat can be tricky, as you're working in tight crowds full of moving people. Further, if the groom is atop an elephant, and you're at human height, you it can be hard to show the scope of the entrance. For this image, I was able to secure a hotel room room above the baraat's projected path. This higher vantage point gave me a unique opportunity to photograph the baraat in a way that truly showed off the entire scene. 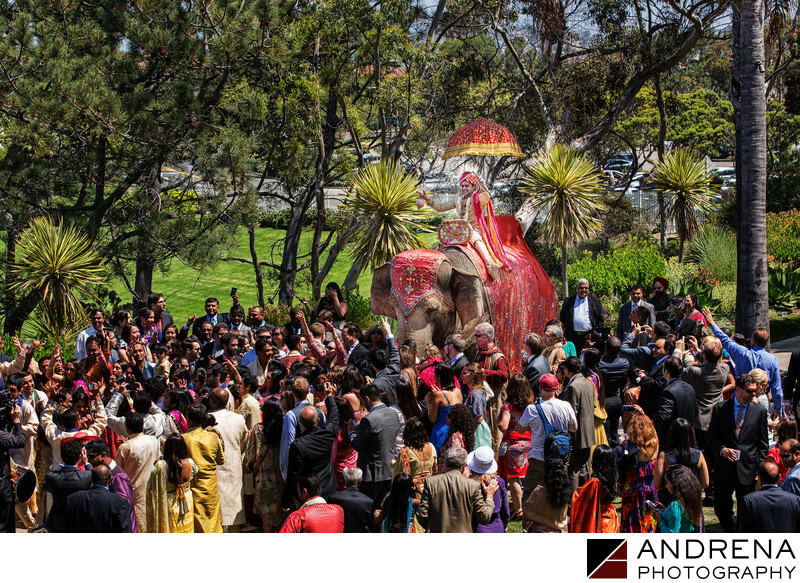 I have worked with Tai the elephant many times, but this is the only time I've been able to secure such a high vantage point overlooking the baraat path. Indian wedding photographed at the Ritz-Carlton Laguna Niguel in Dana Point, California.